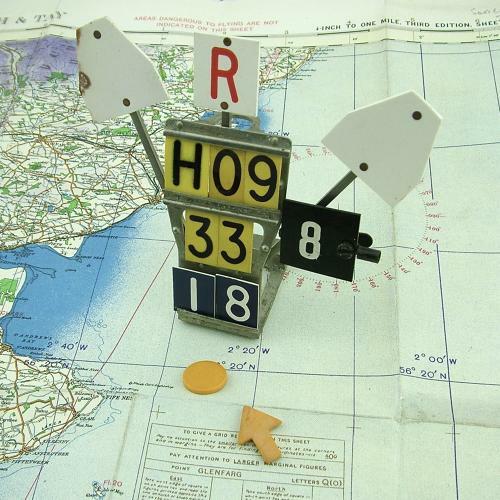 Incredibly rare 'Raid Block' and 'counters' used in RAF filter and sector Ops rooms during the Battle of Britain and beyond to display important information relating to an enemy raid. When details of aircraft were received at Group Filter room level it was interpreted on a map table using plotting 'counters' in the form of coloured arrows, discs and shields. Arrows indicated aircraft seen over land by Observers or over sea by radiolocation. Shields indicated aircraft heard over land or sea by Observers and discs indicated circling aircraft. The colour of the plotting pieces related directly to those on the Sector clock such that information was updated every 5 minutes. The raid block itself was normally positioned at the head of the plotting path and provided additional information such as strength, height and whether the aircraft were 'hostile', 'friendly' or 'unknown'. Both wood and metal blocks were used during the war (as illustrated in a Secret Air Defence Pamphlet). This example is made of alloy and stands approximately 9cm tall x 5cm wide x 5cm deep with integral 'rails' on which the plastic letters and numbers can be placed. Information on the bottom line, in this case '18' marked in white on blue, indicates the height; the middle line, in this case '33' (normally white on red) indicates the raid strength and the top line (H09) is for the serial number allocated to the raid. The symbol at the top centre indicates identity, here shown red on white for 'friendly' aircraft. Other information could be added to the block in the form of plotting pieces on metal 'stalks' as seen here. The white number '8' on black backing can be clipped to the block. In addition to the block we are offering two 'yellow' counters in the form of an arrow and disc (see information above on the use of these). The block lacks one of the four rails (2nd from the bottom up) but is otherwise in ecxellent condition. The plotting counters are a little faded and soiled. We have had other Operations room counters in the form of small metal 'tiles' with numbers marked on them but this is the first time we are able to offer a raid block. A fantastic opportunity to create a small Operations room display. If you are lucky enough to own a Sector clock then this is a must have item. Stock code DF-NBRM1.